In 2003, the independent movie “The Room” premiered to a baffled audience in Los Angeles. At the time, no one could have predicted the cult phenomenon it would become. 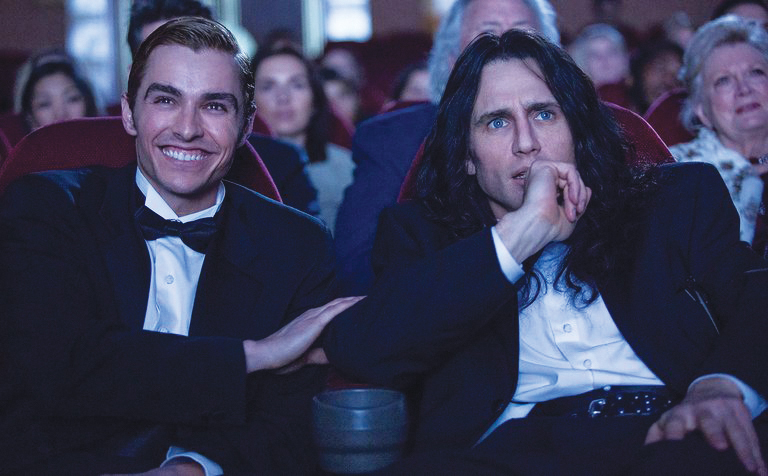 Dave Franco, left, and James Franco, right, in this still from “The Disaster Artist.” Courtesy photo. That strange journey is chronicled in “The Disaster Artist,” a film directed, starring and written by James Franco. The one-of-a-kind comedy-drama hits the Panida Theater this week as the latest in the Reader Reels film series. Based on the book by the same name, “The Disaster Artist” examines the making of “The Room” — a story somehow even more strange than the movie itself — and the bizarre personality at its center: Tommy Wiseau. Speaking in a thick, unplaceable accent and driven by unshakable self-confidence, Wiseau’s frustrated dreams of movie stardom drive him write, direct, finance and act in his own movie instead. A surreal production results in “The Room,” now regarded as one of the most infamous so-bad-it’s-good movies ever made. “The Disaster Artist” is about dreams that outsize personal talent — and the surprising twists those dreams take when they’re pursued anyway. “The Disaster Artist” features a talented cast of well-known comedians, with James Franco in the lead as Tommy Wiseau. Finding a vulnerable human behind Wiseau’s unusual public persona is no simple task, but Franco’s portrayal, from the accent to the flowing black hair, received critical praise. Wiseau’s bizarre directorial decisions — at one point he orders an alleyway set despite a perfectly good alley being located nearby because he’s making a “real Hollywood movie” — make for plenty of laughs. But at the movie’s heart is an earnestness and a longing that drives all artists, whether they’re capable of realizing their dreams or not. Catch “The Disaster Artist” at the Panida Theater 7:30 p.m. Thursday, March 15, and 5:30 p.m. and 8 p.m. Friday, March 16. Next story Sandpoint’s St. Paddy’s Day — in a pinch!